Hadrian's Wall once marked the northern boundary of the Roman Empire. It stretched for nearly 80 miles, across the narrow neck of the Roman province of Britannia, from the North Sea on the east to the Solway Firth ports of the Irish Sea on the West. It crossed some of the wildest, most beautiful landscapes in England. Today, nearly 2,000 years after it was built, it is a UNESCO World Heritage Site and the most popular tourist attraction in Northern England. A remarkable amount of it remains — in fortresses and settlements, in "mile castles" and bath houses, barracks, ramparts and in long, uninterrupted stretches of the wall itself. Visitors can walk the route, cycle or drive to many of its landmarks, visit fascinating museums and archaeological digs, or even take a dedicated bus — the AD122, Hadrian's Wall Country Bus — along it. Roman history buffs may recognize that bus route number as the year that Hadrian's Wall was built. The Romans had occupied Britain from AD 43 and had pushed into Scotland, conquering Scottish tribes, by AD 85. But the Scots remained a troublesome lot and in AD 117, when Emperor Hadrian came to power, he ordered the building of a wall to consolidate and defend the Empire's northern border. He came to inspect it in AD 122 and that is generally the date given for its origins but, in all likelihood, it was started earlier. It followed the route of a much earlier Roman road across the country, the Stanegate, and several of its fortresses and legionnaire posts already existed before the wall was built. Nevertheless, Hadrian usually gets all the credit. And one of his innovations was the creation of customs gates in the wall so taxes and tolls could be collected from locals crossing the borders on market days. It took three Roman legions — or 15,000 men — six years to complete a remarkable engineering achievement, across rugged terrain, mountains, rivers and streams, and to extend the wall coast to coast. But the Romans were already facing pressure from several different directions. By the time they built the wall, the Empire was already in decline. They tried to push northward into Scotland and briefly abandoned the wall while they built another one 100 miles north. The Antonine Wall across Scotland never got much further than the building of a 37 mile long earthwork before the Romans retreated back to Hadrian's Wall. By 300 years later, in 410 AD, the Romans were gone and the wall was virtually abandoned. For a while, local administrators maintained customs posts and local tax collection along the wall, but before long, it became little more than a source of ready made building materials. If you visit towns across that part of England, you will see signs of dressed Roman granite in the walls of medieval churches and public building, homes, even stone barns and stables. It's remarkable that so much of Hadrian's Wall still exists for you to see. 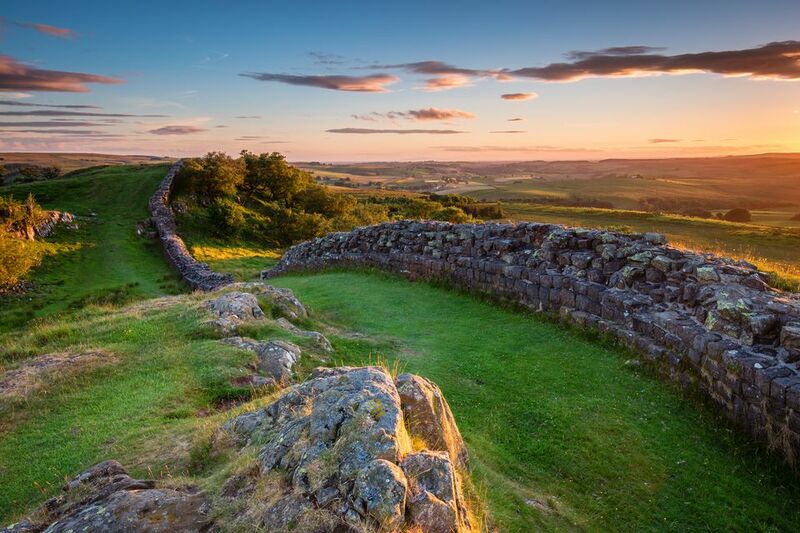 Visitors to Hadrian's Wall can choose to walk along the wall itself, to visit interesting sites and museums along the wall or to combine the two activities. What you choose will depend, somewhat on your interest in outdoor pursuits. Walking the Wall: The best stretches of intact Roman wall are in the center of the country along the Hadrian's Wall Path, a long distance National Trail. The longest stretches are between Birdoswald Roman Fort and Sycamore Gap. There are particularly scenic reaches of the wall near Cawfields and Steel Rigg in Northumberland National Park. Much of this is deceptively difficult terrain, exposed to harsh, changeable weather with very steep hills in places. Luckily, the path can be divided into shorter and circular stretches — between stops on the AD122 bus route, perhaps. The bus runs from the beginning of March through the end of October (the beginning and end of the season seem to change every year, so best check the online timetable). It has regular stops, but it will stop to pick up walkers wherever it is safe to do so. The tourism organization Hadrian's Wall Country publishes a very useful downloadable booklet about walking Hadrian's Wall that includes many clear, easy to use maps with information about bus stops, hostels and shelters, parking, landmarks, places to eat and drink and restrooms. If you are planning a walking tour in this area, definitely download this excellent, free, 44-page brochure. Cycling the Wall: Hadrian's Cycleway is part of the National Cycle Network, indicated as NCR 72 on signs. It is not a mountain bike trail so it does not follow the wall over delicate natural terrain, but uses paved roads and small traffic free lanes nearby. If you want to actually see the wall, you need to secure your bicycle and hike to it. Birdoswald Roman Fort is the site of the longest remaining continuous stretch of the wall. The outer defensive wall of the fort itself is the best preserved of any along the wall and encloses the whole of the fort area, including granaries and five of its six original gatehouses. The site has produced some of the best archaeological evidence of what happened to Hadrian's Wall when the Romans left Britain. New visitor experiences and facilities, built with an investment of £1.3 million, were opened to the public in 2018. They include a new exhibition that allows visitors to step into the world of a Roman Soldier, a cafe, a shop and a family room with family oriented activities. Opening hours, as of March 2019, are from Wednesday to Sunday, 10:00 a.m. to 6:00 p.m. Adult admission without Gift Aid is £8.30; child and family tickets as well as concessions are available. The site is included on the English Heritage Overseas Visitors Pass. Chesters Roman Fort and Museum, about 30 miles from the eastern end of the wall, is the best preserved Roman cavalry fort and military bath house in Britain. The bath house, close to the River Tyne, is fascinating, with walls preserved to the height of the beginning of the arches in some areas. There are barracks and a colonnaded commander's house as well an excellent museum with archaeological finds from the site. One reason that Chesters may be so well preserved is that it was protected from stone robbers and ploughing by the local landowner, John Clayton, who made excavating and protecting the site (and others he acquired along the wall) his life's work. It was a long life for the age, through the turn of the 19th century almost to the 20th, from 1792 until 1890. Opening hours are the same as those of Birdoswald Roman Fort, above. Adult admission, without Gift Aid is £7; child and family tickets as well as concessions are available. The site is included on the English Heritage Overseas Visitors Pass. Corbridge Roman Town. Over a period of 350 years, Corbridge gradually changed from a military supply base for Roman legions to a thriving civilian town where people of different cultures from all over the Empire lived and traded. As of 2018, visitors can see the fruits of a £575,000 investment in a new exhibition that creates an exiting context for the more than 150,000 objects unearthed at the site. The Corbridge artifact collection is one of the largest in the care of English Heritage. At least 20 percent of the Corbridge Collection, glass, pottery, metalwork and personal ornaments, has never been seen in public before. The site is about 19 miles west of Newcastle-upon-Tyne via the A69. There is bus services from the city as well as the village of Hexham. The modern town of Corbridge is served by trains and the station is about a 20 minute walk from the Roman site. There is limited free parking at the site and more free parking in the modern town, about a mile and a quarter away. Opening hours are weekends from 10:00 a.m. to 4:00 p.m. during March 2019, and then beginning in April, hours are 10:00 a.m. to 6:00 p.m. seven days a week. Adult admission is £7.90, with child, family tickets and concessions available as well as inclusion in the Overseas Visitors Pass. Housesteads Roman Fort, the most complete Roman fort in Britain, is on the edge of Northumberland National Park near Bardon Mill/Haydon Bridge or Haltwhistle train stations. Its high position offers amazing views over the surrounding countryside, and east of the fort's north wall, great stretches of Hadrian's Wall. At least 800 Roman soldiers lived and worked at Housesteads. And they weren't shy about their prowess; According to English Heritage which, along with the National Trust, owns and manages the site, the fort's original name, Vercovicium, means "the place of the effective fighters." The site includes a barracks block, hospital, commander's house and communal toilets. The museum at the site illustrates how the fort and the nearby civilian town, were built. There's a National Trust Visitors Center with refreshments. This site requires a certain level of fitness as the 10 minute walk from the Visitor's Center to the fort itself is described as "fairly strenuous." Opening hours are 10:00 a.m. to 6:00 p.m. seven days a week. Conditions of entry and use of the English Heritage Overseas Visitors Pass are the same as other English Heritage sites along the wall. Standard adult admission is £8.10. Hadrian's Wall Ltd. offer tours and short breaks along the wall, ranging from a one-day, 4-wheel-drive safari with stops at key sites along the wall to two or three night short stays in a centrally located cottage with safaris, self-guided or guided walks coupled with vehicle drop offs and pick ups. The company's options are ideal for anyone who doesn't want to walk fixed distances every day or who is worried about walking long distances in the rugged, windswept terrain. Prices (in 2018) were from £250 for groups of up to six people on a one-day safari to £275 per person for three-night, midweek short breaks with safaris and self-guided walks. Hadrian's Wall Country, the excellent official website for businesses, attractions and landmarks along the length of Hadrian's Wall, maintains a list of qualified and recommended tour guides who can make a visit to the wall meaningful, entertaining and safe. Between Newcastle/Gateshead in the east and Carlisle in the west, this is an area so chock full of castles, excavations, and medieval and Roman landmarks it would take several thousand words to list them all. Once again, check the Hadrian's Wall Country website, which has great information and resources on things to do for all interests in the area. But, one "must visit" site is the Roman Vindolanda and Roman Army Museum, a working archaeological dig, educational site and family attraction not far from the wall. Every summer, archaeologists uncover remarkable things at this garrison settlement that predates Hadrian's Wall and lasted as a working settlement until the 9th century, 400 years after the wall was abandoned. Vindolanda served as a base and staging place for the soldiers and workers who built Hadrian's Wall. Among the site's most remarkable finds are the Vindolanda writing tablets. The tablets, thin slivers of wood covered with letters and correspondence, are the oldest surviving examples of handwriting ever found in Britain. Voted by experts and the public as "Britain's Top Treasure," the thoughts and sentiments on these documents are evidence to the mundane details of the everyday lives of Roman soldiers and workers. Birthday greetings, party invitations, requests for shipments of underpants and warm socks are scribbled on thin,paper-like leaves of wood that, amazingly survived almost 2,000 years by being buried in a boggy, oxygen free environment. There is really nothing else like these tablets in the world. Most of the tablets are kept at the British Museum in London, but since 2011, thanks to a multi-million pound investment, some of the letters have now been returned to Vindolanda, where they are displayed in a hermetically sealed case. Vindolanda is family-friendly, with activities, films, exhibits and a chance to see and participate in real archaeology every summer. The site is run by a charitable trust and admission is charged.